Earning money from VigLink is easy as an online Publisher. They pay their publishers 75% of the gross earning when VigLink Convert and VigLink Anywhere are being used, where they automatically monetize existing links. Publishers can also earn more than double through the use of VigLink Insert. Since Viglink have the scale and technology, they are able to negotiate increased commissions for their Publishers coming from online retailers in order to maximize the average earnings per click. Your unique and original content is very valuable to the commercial industry. All you need to do as a Publisher is to find time in writing them, and allow VigLink to insert those words that identifies to commercial linking opportunities from your written content and transform them into links that that can earn you passive income. With their use of real-time technology and less manual work for you in linking commercial text ads, they are able to determine the most valuable marketing potential of your written content. Their real-time technology can point out the most valuable commercial keywords based upon the current market demand. They pay through PayPal at the end of each month and cover the fees with a $10.00 monthly minimum. You can even earn from your social influence coming Facebook, Twitter, etc. All you need to do is to capture what you want to share by running links through VigLink Anywhere before you post. You can also shorten your shared links via any link shortener. You can increase your earnings as well as the scale of influence of your content by using VigLink Anywhere through another network like email. The nice thing about VigLink is that they can easily monetize various links to thousands of retailers. There are links from your website that will earn only after a sale is completed (Cost per Action or CPA), and others will earn immediately upon click (Cost per Click or CPC). They have thousands of merchants in their Network and will try to route traffic through those programs that will earn you the most money so that in turn they will also earn. There are times that you had a sale on a certain merchant but it will not show up because that merchant pays per click on certain links and products but not per purchase. Sometimes you may have a revenue showing in your dashboard under a merchant, but there is no "action”, so this only means that the merchant simply pays per click on certain links. In this way, you generated revenue from that merchant even though a purchase never took place. They have one of the best in-text affiliate advertising networks and works in a unique way than other monetization programs because you don’t need to be signed up for every merchant affiliate. 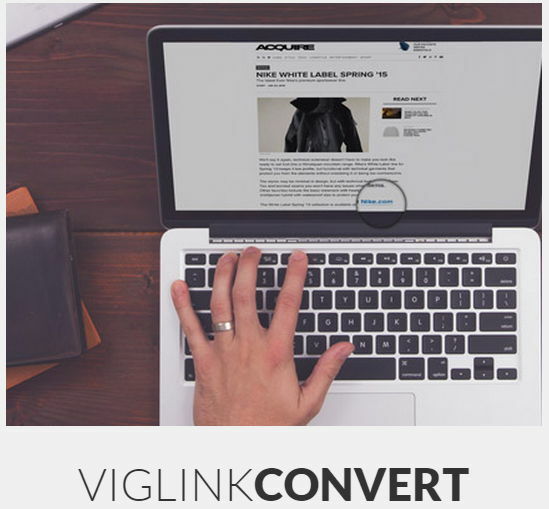 For example, if you have a website or blog that talks about a certain hobby and you write about the best tools for it, VigLink will instantly convert your outbound links into affiliate links. As a Publisher, you will earn money whenever someone purchases any of the recommended tools that you wrote about through that merchant online store. They automatically monetizes all your outbound links, and this will let you save time plus your income will also increase. You can simply choose what webpage that you want to work with them and if you have AdSense, they will work smoothly with it too. 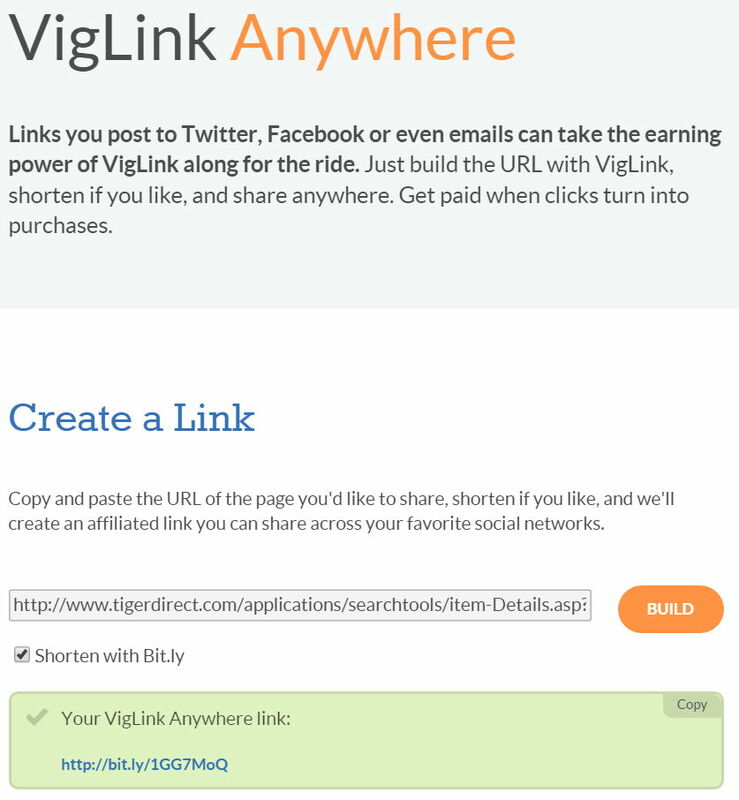 So if you are already using other affiliate links on your blog or website, VigLink does not interfere nor change those links that you already have installed. This code must be present on every webpage where you would like VigLink to work. I recommend that you install this code everywhere by adding it to your blog or website’s template. If you want to use their advanced installation and API documentation, you can simply visit their Developer Center. You can create Anywhere links directly from a merchant’s site like from Tiger Direct. Just add the Anywhere Bookmarklet to your toolbar and you'll be earning money if a customer will click the link and purchase something from that particular merchant's website. If you want to install the Anywhere Bookmarklet, simply click and drag the "Bookmarklet" badge below to your bookmarks bar. Once you can find the right page that you want to share, just click the bookmark, and it will load in a few seconds. Take note that before you install it, choose first a default campaign to associate with the Anywhere links that you like to create with the Bookmarklet. You may try VigLink as an in-text network affiliate and check whether your income report will increase compared to other in-text affiliates that you had before. It’s a great way to earn revenue from your blog or website's outbound links and signing up only takes 3-5 minutes plus it’s free and has zero ongoing maintenance. If you try and turn on the VigLink app in CloudFlare, you are ready to go to earn money because it has no installation or cutting and pasting of code required. It will track the outbound links you already have. It looks clean on your website or blog because it has no ads, annoying pop-ups, or double underlines. Their links will just work smoothly within your content and existing affiliate links, plus it adds to your online income too. The good thing about their technology is that, it will not touch nor bother your already affiliated links once you install them. Whether you have affiliate links from Amazon, CJ, Ebay, or other affiliate programs, VigLink undo or re-write any of them. However, they will give you an option if you would like them to re-affiliate your already affiliated links such as your eBay and Amazon. You can re-affiliate or overwrite already affiliated links from eBay and Amazon links on your blog, website or even forum. If you want this to happen, you need to go to your account and allow VigLink to overwrite and affiliate all of your Amazon & eBay links by simply checking the "Reaffiliate" box in your VigLink Features tab under the Settings for "Affiliation". After you check the "Reaffiliate" box and then save your settings, VigLink will re-affiliate all of your Amazon and eBay links. On the other hand, if you can see the Merchant Explorer that shows merchants as "restricted," this means that your blog, website or account must be approved first for those merchants before you can affiliate with them. If you want to get approval from restricted merchants, you need to submit a support request for affiliation. When submitting a request, you can include your VigLink Account email address, your blog or website URL and any other pertinent information that could help you get your blog or website approved. The approval time depends on the merchant, but generally takes up to a week. Generally, restricted merchants shall approve blogs or sites with original content and has high relevance to their products or services. Don’t expect to see any ads or banners on your blog or web site, because VigLink will not create them. They only offer two things, they affiliate existing merchant links on your blog or website and then they insert links for brand and merchant names that appear in your blog or website's content. For example, if your content has the word "Ebay", or "Phablet" in it, they turn those words into affiliated links. So if one of your readers will click on one of those links and makes a purchase, you can make a commission. If you have affiliate links to merchants on your blog or website, Viglink can also affiliate those for you as long as the merchant is in their network. They can affiliate any product links that you post on your blog or website. For example, if you want to post a link to a certain electronic gadget on Ebay, you just need to copy the regular link from Ebay.com and post it on your blog or website. May this VigLink review has helped you in looking for the right affiliate network when earning money from your website or blog. As a Publisher, I am earning revenue from Viglink. Kindly feel free to share your feedback in the comments section below if you have used this network or other networks that were legitimate and reliable too. If you find this post useful, please share it with your friends and family on Twitter, Facebook and Google Plus, thanks in advance.